YOU. GUYS. I AM SO STOKED ABOUT THIS ONE. Those of you who follow me on Twitter know that I have been struggling to recreate the original crème brûlée without any animal byproducts. The first attempts took place last summer, when I was convinced tofu was the answer to replicate that creamy, jiggling texture, as well as sort of ‘healthify’ (yuck) the recipe. Fail, fail, fail. Then I tried it again last week, thinking this time for sure I had the answer. Cashews! If I just made a cashew cream, the texture would be bang on. Nah-uh. It was thick and creamy, sure, but where was that yummy jiggling? The pudding was solid and thick as muck. Back to square one. Someone on Twitter then mentioned agar agar flakes. I had thought about it before but as you know I always try to keep things simple on this blog; that means avoiding rare and/or expensive ingredients if I can help it. Well I guess this time I couldn’t, so I gave that old transparent seaweed flakes a go. AND LO AND BEHOLD – PERFECT CRÈME BRÛLÉE! I am so ecstatic that all caps are required to express my joy. I DID! It jiggles! It’s yellow! It’s creamy! It’s SO EFFING YUMMY! P.S. : Do read the notes on the recipe carefully. If you’ve never used agar or coconut milk in cooking before, READ THE NOTES. P.P.S. : Cute cat photo at the bottom of this post, because I know you guys are besotted with Mali. Add all of the ingredients for the cream to a saucepan over high heat. You want to bring the coconut milk almost to the boil, stirring continuously as you do so to prevent burning and to mix all the ingredients evenly. The agar agar flakes should soon start to dissolve. When the milk looks like it’s about to boil, remove the saucepan from the heat. Stir a few more times to ensure all the ingredients are evenly blended, then set aside to cool. Pour the cream into 6 individual ramekins and place in the fridge to set for about 3 hours. If you wish to leave the puddings in the fridge for longer, please see the notes below. Scatter a heaping teaspoon of white sugar evenly over each pudding, then caramelise using a kitchen blowtorch. Leave to cool for a minute, after which the caramel topping will be hard. Serve immediately, with a side of vanilla ice cream if desired. Coconut milk always separates in the fridge. Although the agar agar flakes will hold together all of the ingredients, much like a panna cotta, a small bit of separation will occur if the ramekins are allowed to stay in the fridge for any longer than 5-6 hours; this will take form in some excess water around the puddings. Luckily these puddings are ready to serve after just 3 hours but if you needed to prepare the crèmes brûlées in advance, you would simply have to drain the excess liquid from the ramekins over a sink, holding your outstretched fingers close over the pudding to prevent it falling out altogether, then proceed with the topping as per the instructions. The puddings will otherwise remain intact and their flavour won’t be affected. I hope you make these for some seriously epic dinner parties. That feeling when you swoop into the room bearing a tray of puddings that people think you slaved hours over but in fact is super duper simple. Or just eat it all yourself. Like I did. Because what good is life without crème brûlée. Caught in a moment of madness. Oh how I love this crazy fur ball. Can you use an alternative to agar agar? Ah, see I knew this question would come up. The short answer is: I don’t know, I haven’t tried it yet. There are several possible alternatives to gelatine, agar agar being one of them, but I have never used any. You’d have to find them online, whichever ones you choose; a quick Google search tells me there is such a thing as vegetarian gelatine, then there’s carrageen (Irish moss). I have only ever used agar agar so far, and always with great success (see my panna cotta recipe), so I’ve stuck with it. It lasts a while, too, so it isn’t very expensive. Irish moss is a great alternative. Mmmmm Yummy, I love that cat ..
Congrats on nailing the recipe!! I have used agar agar and irish moss to recreate the same texture and used coconut milk. This looks perfect with the sugar crust to match! Thanks, Christina! I haven’t tried Irish Moss yet but I’m really curious about it now. 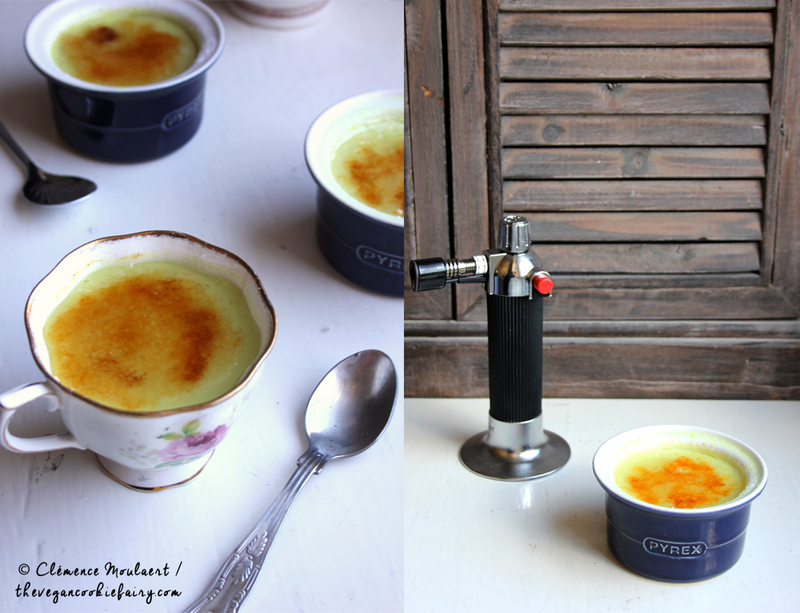 This looks so simple for Creme Brulee!New to the site and really like it.Can’t wait to see what you post next. I don’t think it does at all! Some people can be really sensitive to the flavour of coconut milk, though. If you think you fall into that category, I would suggest you add a little bit of extra sweetener and vanilla extract to mask the coconut flavour. Hi Jenna! I lost a lot of recipes recently and I’m trying to add them all back as soon as possible, but it’s requiring a lot of time! Will try and add this recipe again asap. Oh no!!! I really appreciate that, this looks sooo good. Hi. Love this recipe. Can’t wait to try it. My question is does the agar agar have to be flakes or do you think powdered agar agar wold work? Wow amazing recipe! I love it! Thank you so much for sharing it! Hey, thanks for your comment. I really appreciate that you like my recipe so much but I can’t let you just share the recipe on YouTube as if it’s yours. You’ve copied my recipe into the description box underneath the video without making it clear that the recipe is mine. I work hard on these recipes and I don’t just hand them out for free. You’re going to have to take down the video or add proper accreditation, i.e. “Recipe and photography by Clemence Moulaert, author of the blog http://www.thevegancookiefairy.com” + a link to this blog post. I need this accreditation to be both in the description and video, and I’d prefer if you removed the full recipe from the description too. Hi! Do you know any replacement for turmenic? I haven’t tried anything else for food colouring, but don’t worry, the flavour doesn’t come through, just the colouring. I want to cuddle that gorgeous cat!!! Now that I’ve got over the cat, what can I do if I don’t have a blow torch? Unfortunately with the coconut cream I find a blowtorch is needed to properly caramelise the sugar. I’ve tried t with the oven grill but mine isn’t particularly strong and just didn’t do the job.